Alex stuart is an Australian guitarist based out of Paris, where he moved in 2005. His latest album named ‘Aftermath‘ was released in Nov 2017 with Jazz Family. 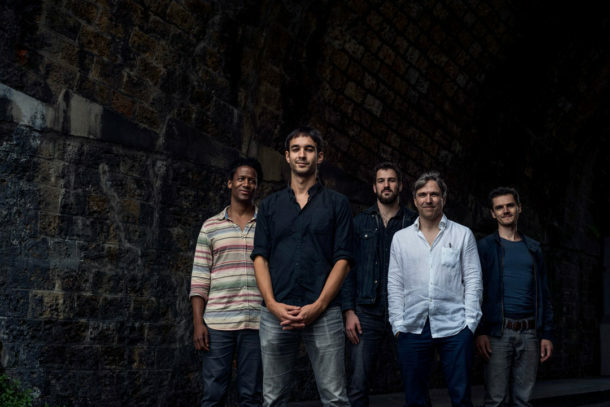 This time with the collaboration of some of the most renowned Parisian musicians, Irving Acao on the saxophone, Ouriel Ellert, on the bass, Arno de Casanove, (Lou Tavano), and Antoine Banvillle on drums. In 2015 Alex formed ‘The Alex Stuart Group’ with whom he released his 3rd album “Place To Be” with Gaya Music. Alongside Alex on the album are the renowned musicians Irving Acao (Chucho Valdes, Ray Lema…) on the saxophone, Christophe Wallemme (Prysm, Ibrahim Maalouf…) on the bass, Antoine Banvillle (Pharoah Sanders, David Venitucci…) on the drums and special guest Stephane Guillaume on the saxophone. The album received a 5 star review from French magazine ‘Nouvelle Vague which also stated that it was “undoubtedly one of the best jazz albums of the year”. It has been feature album on France Musique’s “Open Jazz” and Australia’s ABC Jazz, received 18/20 from the magazine HiFi Video, 4 stars in John McBeath’s review in the Australian, earnt the “We like a lot” rating from French magazine Telerama and had many other praising reviews. “Place to Be” follows Alex’s last album “Around” released in 2010 and recorded with his quartet featuring the highly regarded Guillaume Perret on the saxophone, Yoann Serra on the drums and Juan-Sebastien Jimenez on the bass. Franck Bergerot of Jazz Magazine / Jazzman, France’s top jazz magazine, awarded Around its prestigious ”Revelation! (Discovery! )” tag (January 2011 edition). John Mcbeath also gave it a four star review in ‘The Australian’ in March 2013. Around has been featured on many radio stations such as Australia’s top national radio jazz program, ABC FM’s ‘Jazztrack’, and France Musique and the quartet also performed live on Radio National ABC’s ‘The Music Show’ presented by Andrew Ford. In July 2011, the quartet took out the prestigious competition “Jazz A Juan Revelation” and was given the “Grand Jury Prize”. Previous winners include Tigran Hamasyan, Youn Sun Nah and Tineke Postma. Alex was nominated for the Freedman Fellowship in Australia in 2013. Alex recorded his first album “Waves” in Sydney in 2005. The eleven other performers included some of Australia’s top jazz musicians such as Eric Ajaye, Miroslav Bukovsky and James Hauptmann. ABC FM’s ‘Jazztrack’ and other FM stations featured Waves, while the ABC’s internet jazz radio station made it their ‘Feature Album’ for an extended period. ‘Jazztrack’s’ Mal Stanley described Waves as “strong, original music from an Australian talent to watch” . Alex also plays and has played with ‘Pinball’, FTB Trio (Maciek Pysz/Alex Stuart/Antoine Banville), Munir Hossn, Brice Wassy, ‘Moonlight Benjamin Quintet’, Julien Wilson, ‘Groove Stance’, ‘Alula’, ‘Black Sesame’, Miroslav Bukovsky, Tulika Srivastava, ‘The Alex Stuart/Warren Walker Band’, ‘Abakuya’, NewElectroSoulSession’, ‘TANG!’, Moira Conrath, Bruno Angelini, Tim Willis, Remi Vignolo, Luc Isenmann, Ben Vanderwal, Eric Ajaye, Dave Panichi and Alex Jacquemin. As a composer Alex is inspired by modern jazz, rock musicians such as Dirty Projectors, Bjork and Grizzly Bear, and the musics of Africa, Asia and Latin America. Inspired by these different elements he creates an organic new music, an ode to cultural openness. Most recently, a stint in ‘Abakuya’, led by Camerounian Francois Essindi, provided a wonderful opportunity to explore the spirit and techniques of West African music, while a 2009 residency in India with master sarodist Anindya Banerjee plunged him into the beautiful melodies and complex rhythms of the Hindustani classical tradition.